Galloway Gazette football correspondent John McNaught report from Trammondford on the weekend’s South Scene local derby. Results from Saturday 4th April, 2015. There was no doubt of the match of the day last Saturday with league leaders Newton Stewart locking horns with second placed Wigtown and Bladnoch at Trammondford Park. It was always felt that his match could be a possible league title decider with the victors obtaining a huge advantage over their opponents with only a few matches left to play. And at the end of the ninety minutes it was the home team who had secured that advantage. The game got off to a fiery start with Wigtown winning a penalty in the first minute which Jamie Adams dispatched behind keeper Harry Fidler into the back of the net. Three minutes later however Newton levelled the match when Thomas Garret latched onto a through ball to find the net from twelve yards. With twenty-two minutes played Wigtown went ahead again through striker Robert Jamieson who turned the visiting defence to find space to beat keeper Fidler to give the home side a slender lead that they held into the half-time break. Controversy followed the re-start when a Jason Gallacher netbound header appeared to have been cleared on the line by a Wigtown outfield players hand but nothing was given and the ball was cleared. Just after the hour mark Wigtown found a third goal when some slack defending allowed Adams to head into an empty net from close in. With twenty minutes left to play Garret was brought down in the box and a penalty awarded which Johnny Fisher lashed into the net to put Newton back into the match. Play then raged from end to end with chances at both ends but Wigtown held out to take the three important points which now makes them favourites to retain the South of Scotland League title. Third placed St Cuthbert Wanderers were expected to give their goal difference a boost when they travelled to play bottom placed Dumfries YMCA but this was not the case winning by a slender one goal in a seven goal encounter. YMCA were two goals to the good through Ryan Johnstone in the first fifteen minutes but Saints fought back to level the match by the interval with two goals from Kieran Kenny. Stewart Gall put the home side ahead again at the start of the second half but Roman Soltys levelled the match again in the sixty-fifth minute. A minute later Saints’ Scott Alexander scored a goal that proved to be the winner. Upper Annandale started as favourites to take the three points from their match against Nithsdale Wanderers at Moffat but had to be content to share the points in a goal-less draw. 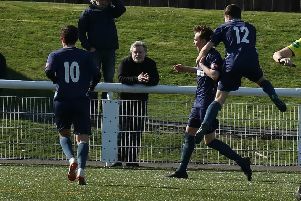 Heston Rovers entertained neighbours Crichton at Palmerston Park and went down by three goals to nil while Creetown went down by the odd goal in three against Lochar Thistle at Castle Cary Park with Micky Sutherland hitting the net for the home side. Abbey Vale had Edusport Academy as their visitors to New Abbey and although the home side are enjoying a good run of form they were beaten by two goals to nil with two second half goals from Boubacar Ndaw and Michael Martins.